Butterscotch pie, don’t knock it until you try it. We welcomed baby Winter into the world in December of last year. My place of work, Target, gives the fathers 2 weeks paternity. Meaning, I got to spend some time at home for the holidays. This is when my passion for cooking re-emerged. I was taken back to my home economics class. I excelled at the cooking portions of the class, and got enjoyment from it. This pie released the memories! Butterscotch is one of my personal favorite flavors. The slightly caramel taste with bitter notes? mmm mmm good! The meringue pillows on top of the pie are delicious. Now, this pie is one that I found in the world of Pinterest. I made a few minor tweaks to it, just due to time and availability. I can’t get enough of this pie. I broke my diet just to eat this pie! It’s not the status quo for pies, but it’s gonna be a instant classic in your house I promise. 1 refrigerated Pie Crust or a homemade one, whatever is clever. This pie is all about time management. Measure out all dry ingredients, and separate the egg whites from the yolks. Once oven is heated, bake crust for 15 minutes. Start a double boiler, which is a medium pot with boiling water and a smaller pot inside of that one. Be sure to watch the water level For proper floating. Do this while pie is in the oven. Another pot/pan, its time to start melting the butter. Melting the butter in a pan creates a better flavor. If you have another small welled pan available (I didn’t) you can start scalding the milk. I used a microwave, just make sure you don’t boil it. 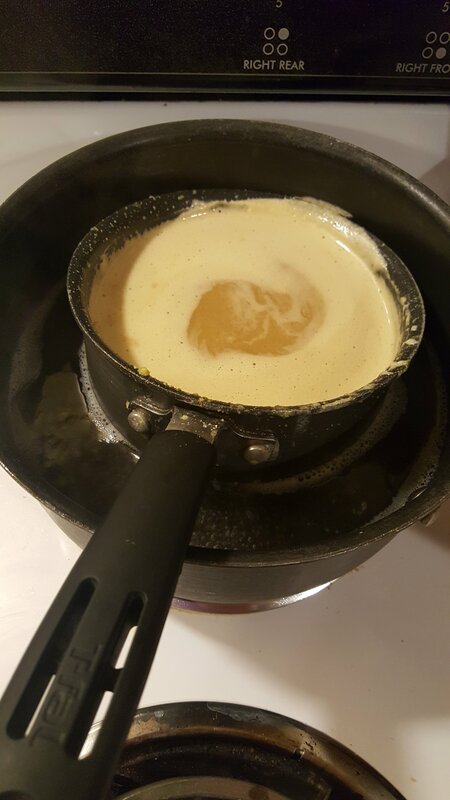 Once butter is melted, remove from heat. Mix in brown sugar, stir in egg yolks. Next add the flour and salt, add the scalded milk and combine. Place mixture back onto a burner on medium and bring to boil. Pour the mixture into double broiler. Let it cook and thicken for 15 to 20 minutes, stirring occasionally. 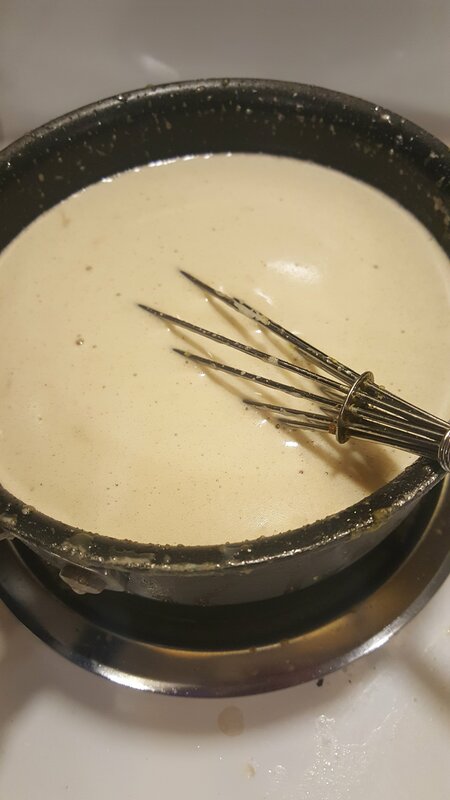 Once the mixture has become thick, and changed to a darken brown pour mixture into cooked pie crust. My white fluffy topping is made with a setup stand mixer. If you don’t have one, a hand mixer will do. Combine all ingredients into the bowl, and mix on medium until large peaks are formed. You should be able to form them easily. 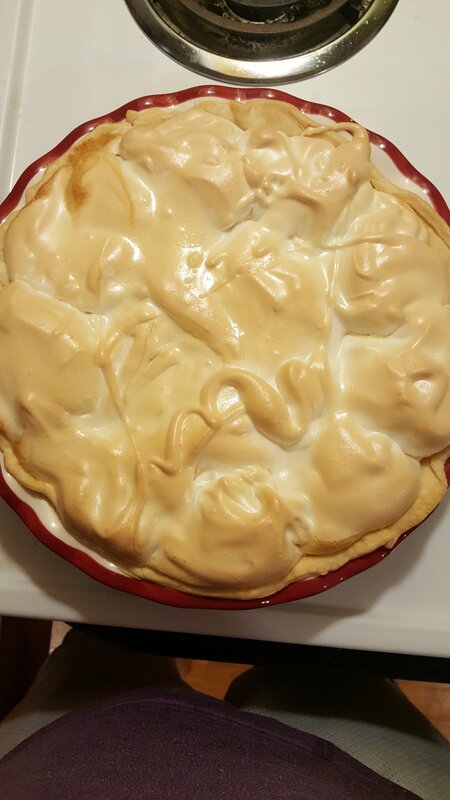 Once done, top pie with meringue and bake at 350 for 15 minutes, or until golden.